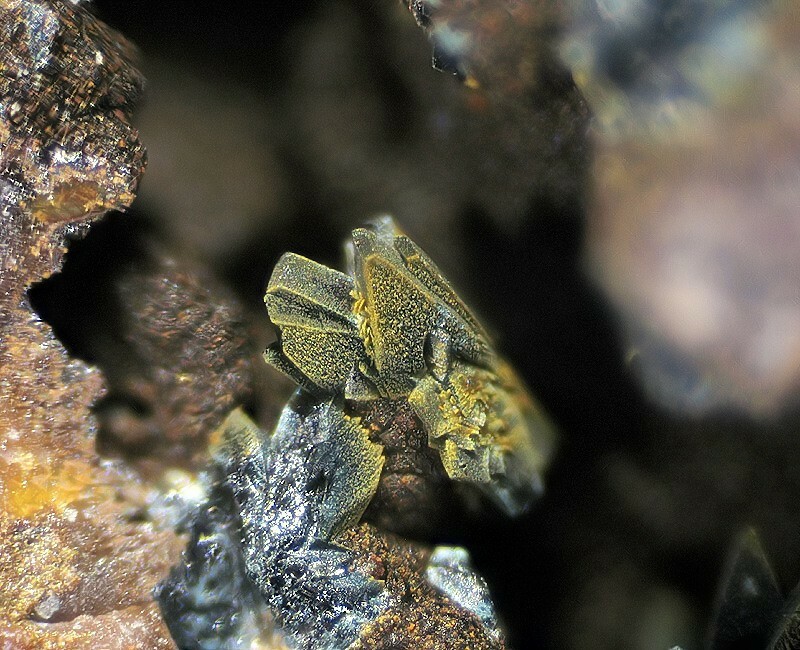 Dufrénite: Mineral information, data and localities. Dark green, olive-green, olive-brown, black; olive-brown to reddish brown with oxidation; bluish green to reddish brown or yellow in transmitted light. The mineral dufrénoysite is also named in his honor. A secondary mineral occurring with limonite in gossan of veins and in iron ore deposits. See also natrodufrénite which appears to be much more common than presently thought (Henry Barwood, unpubl. results). A (formally) vacancy- and Mn2+-dominant member was reported by Sejkora et al. (2006). Note: dufrénite is the correct spelling, not dufrenite (Burke, 2008). There are some dufrenite-like species, e.g., 'UM1949-01-PO:Fe'. One perfect, a second cleavage good and both parallel to the fibre direction, with traces of a poor third cleavage at right angles to the other two. Crystals rare, indistinct, in subparallel or sheaf-like aggregates. Botryoidal masses or crusts with a radial-fibrous structure, common. The crusts are formed of drusy crystals with rounded or exfoliated terminations at times. Natrodufrénite NaFe2+Fe3+5(PO4)4(OH)6 · 2H2O Mon. Leucophosphite 42 photos of Dufrénite associated with Leucophosphite on mindat.org. Cyrilovite 27 photos of Dufrénite associated with Cyrilovite on mindat.org. Kidwellite 24 photos of Dufrénite associated with Kidwellite on mindat.org. Strengite 24 photos of Dufrénite associated with Strengite on mindat.org. Bariopharmacosiderite 21 photos of Dufrénite associated with Bariopharmacosiderite on mindat.org. Cacoxenite 18 photos of Dufrénite associated with Cacoxenite on mindat.org. Beraunite 16 photos of Dufrénite associated with Beraunite on mindat.org. Chalcosiderite 15 photos of Dufrénite associated with Chalcosiderite on mindat.org. Rockbridgeite 9 photos of Dufrénite associated with Rockbridgeite on mindat.org. Goethite 8 photos of Dufrénite associated with Goethite on mindat.org. 42.9.1.3 Natrodufrénite NaFe2+Fe3+5(PO4)4(OH)6 · 2H2O Mon. Jordan (1803) Min. Reisebem. : 243 (as Strahlstein). Brongniart, A. 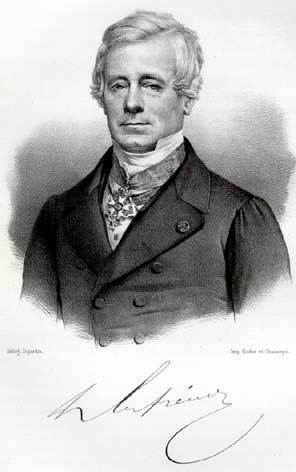 (1833) Dufrénite. in Tableau de la distribution méthodique des espèces minérales suivie dans le cours de minèralogie fait au Musèum Royal d'Histoire Naturelle en 1833, A la Librairie Encyclopèdique de Roret (Paris), 48pp., 8vo: 20. Kinch, E., Butler, F.H. (1886) On a new variety of mineral from Cornwall. Mineralogical Magazine: 7: 65-70. Kinch, E. (1888) On Dufrenite from Cornwall. Mineralogical Magazine: 8: 112-115. Hintze, C. (1889) Handbuch der Mineralogie. Berlin and Leipzig. 6 volumes: 1 [4B]: 1122. Clarke (1910) USGS Bull. 419: 303. Simpson, E.S. (1911) Journal of the Natural History Society of Western Australia: 4: 3. Frondel, C. (1949) The dufrenite problem. American Mineralogist: 34: 513-540. Palache, C., Berman, H., Frondel, C. (1951) The System of Mineralogy of James Dwight Dana and Edward Salisbury Dana, Yale University 1837-1892, Volume II. John Wiley and Sons, Inc., New York, 7th edition, revised and enlarged, 1124 pp. : 873-875.
van der Westhuizen, W.A., de Bruiyn, H., Beukes, G.J. 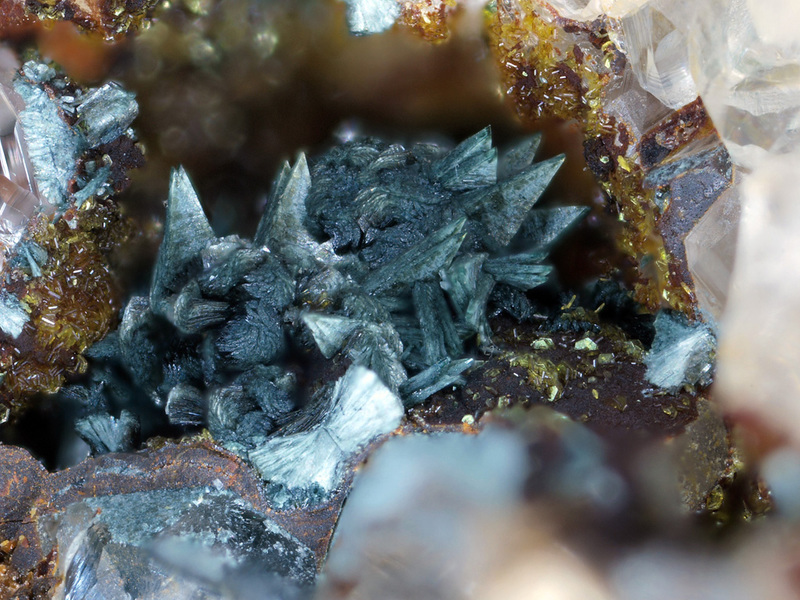 (1990) Dufrenite in iron-formation on the Kangnas farm, Aggeneys district, Bushmanland, South Africa. Mineralogical Magazine: 54: 419-424. Sejkora, J., Škoda, R., Ondruš, P., Beran, P., Susser, C. (2006) Mineralogy of phosphate accumulations in the Huber stock, Krásno ore district, Slavkovský les area, Czech Republic. Journal of the Czech Geological Society: 51: 103-147. Dyar, M.D., Jawin, E.R., Breves, E., Marchand, G., Nelms, M., Lane, M.D., Mertzman, S.A., Bish, D.L., Bishop, J.L. (2014) Mössbauer parameters of iron in phosphate minerals: Implications for interpretation of martian data. American Mineralogist: 99: 914-942. OYARZABAL, J. and GALLISKI, M.A.. Hureaulite, Mn+25(H2O)4[PO3(OH)]2[PO4]2, from different deposits of the Totoral pegmatitic field, San Luis. Rev. Asoc. Geol. Argent. [online]. 2007, vol.62, n.2, pp. 210-216.; Galliski, M. A., Zavalia, M. F. M., de Upton, I. L., & Oyarzabal, J. C. (1998). Mitridatite from the San Luis granitic pegmatite, La Florida, Argentina. The Canadian Mineralogist, 36(2), 395-397. Harrowfield, I.R., Segnit, E.R., Watts, J.A. (1981) Aldermanite, a new magnesium aluminium phosphate. Mineralogical Magazine, 44:333, 59-62. Frost, R.L., S.J. Mills, and K.L. Erickson, (2004), Thermal decomposition of peisleyite: a thermogravimetry and hot stage Raman spectroscopic study. Thermochimica Acta, 419(1-2): p. 109-114. W. D. Birch and D. A. Henry in Phosphate Minerals of Victoria, p.83-90. Simpson, E. S. (1920): Gearksutite at Gingin, Western Australia. Mineralogical Magazine 19, 23-39. Škoda, R., Rus, P.: Revize dufrenitu z Poniklé. Minerál, 2010, roč. 18, č. 2, s. 119-123. Weber, A.: Fosfáty z pegmatitů jz. Čech. Rozpravy II. třídy České akademie, 1948, roč. 58, č. 1. Walenta, K. & Binder, W. (1980): Kidwellit und Dufrenit aus den Mines de Montmins bei Echassiéres (französisches Zentralmassiv). Aufschluss 31, 51-54.; Le Règne Minéral, (33), 5-25. Dana 6: 797, 823; Dana 7:II:874, 960. S. Weiss: "Mineralfundstellen, Deutschland West", Weise (Munich), 1990; Overkott, T. & Reinhardt, M. (2007): Dufrenit vom Hollerter Zug im Siegerland. Lapis 32 (11), 42. Pestel, S., Graichen, R. (2012) Die Dufrénite der Thekla-Fundgrube zu Hauptmannsgrün. Mineralienwelt, 23(5), 18-23. Witzke, T., Rüger, F., Martin, M., Graf, J., and Baum, M. (2001): Ullersreuth, ein traditionelles thüringisches Bergbaugebiet. Lapis 26(12), 13-27. Stara P., Rizzo R. and Tanca G. (1996): Iglesiente e Arburese. Miniere e minerali. E.M.Sa. Ed., pagg. 105-106. Matsubara, S. & Kato, A. (1980) Koubutsugaku Zasshi, 14, 269-286. BELLO, A. d'O. (1909-1913) Mineraux portugais. Bull. Soc. Portugaise Sci. Nat., 2, 272-280; 4, 68-78; 6, 90-103; Mineral samples in the Collection of the IST (Instituto Superior Técnico); Pedro Alves, collection and in situ observations. Rewitzer, C. and Röschl, N. (1984) Portugal. Lapis, 9(12). 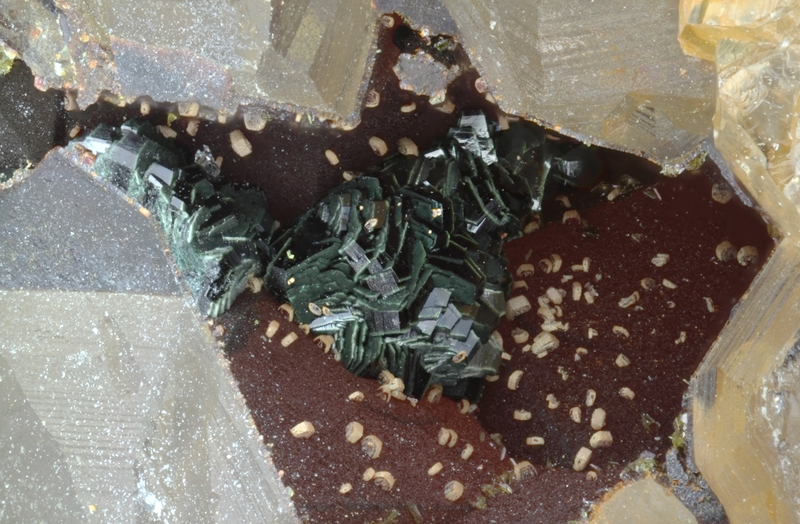 ; van den Berg, W. (1992) Enkele vermaarde mineralenvindplaatsen in Midden-Portugal. Gea, 1992(1), 38-39 (in Dutch). Sáinz de Baranda, B., Palero, F.J., García, G. (2004): El Horcajo, las piromorfitas más famosas del mundo. Bocamina, 13, 32-68. Camprubí, A., Costa, F., Melgarejo, J.C., 1994. Mineralizaciones de fosfatos férrico-alumínicos de Gavà (Catalunya): tipología. Boletín Geológico y Minero, v. 105-5, p. 444-453. Kinch, E., Butler, F.H., and Miers, H.A. (1886) On a new variety of mineral from Cornwall. Mineralogical Magazine, vol. 7, n° 33, 65-70.; Kinch, E. (1888) On dufrenite from Cornwall. Mineralogical Magazine, vol. 8, n° 37, 112-115.; Frondel, C. (1949) The dufrenite problem. American Mineralogist, vol. 34, p. 513-540.; Kingsbury, A.W.G. (1957) Rockbridgeite from Cornwall and Devon. Mineralogical Magazine, vol. 31, n° 236, 429-430. Elton, N. J. (1998): Barbosalite, frondelite and other phosphates from Gunheath China Clay Pit, St Austell, Cornwall, England. Journal of the Russell Society 7, 15-18. ; Mineralogical Magazine 1996 60 : 517-518. Hartley, J. (1984) A list of minerals associated with the ore deposits of the Caldbeck Fells, Cumbria. Transactions of the Leeds Geological Association, 10(3), 22-39.; Cooper, M.P. and Stanley, C.J. (1990) Minerals of the English Lake District: Caldbeck Fells. Natural History Museum Publications, London, 160 pp. (referring to Hartley, 1984). ⓘ East Wheal Russell ? Kingsbury, A.W.G. (1957) Rockbridgeite from Cornwall and Devon. Mineralogical Magazine, vol. 31, n° 236, 429-430. Barwood, H. & Hajek, B. (1978): Notes of Some New Occurences in Alabama. Mineralogical Record. 9: 388-391; Min.Rec.:20(5):361. Rocks & Minerals: 63: 120. Meyers & Stewart (1956) Geology of New Hampshire, part III. The Minerals of New York City & Its Environs, New York Mineralogical Club Bull. Vil. 3, No. 1, Manchester, J.G. (1931): 81.
ⓘ Tin Queen Mine (White Blowout Mine) ? Edwin B, Eckel (1938) The Brown Iron Ores of East Texas. USGS Bull. 902: 127-128 Arthur E. Smith (2009) The Mineralogy of Texas. Unpublished manuscript. Kearns, L. E. and Penick, D. A. (1989): The Dixie Mine, Rockbridge County, Virginia. Rocks and Minerals, 64, 42-45. (also see Rocks & Min. :57:20-22 & 60:168); Watson(1907).